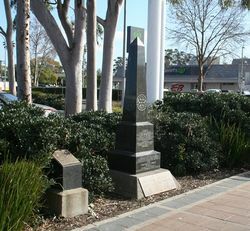 Obelisk commemorates the site of the outcrop of the Top Greta Coal seam which was the economic foundation of the city. 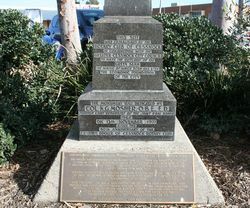 Originally located in Cumberland Street, it was moved to a more prominent location by Cessnock Council in 1999 and a plaque has been added to commemorate the contribution of coal mining to the Cessnock region. The discovery of the Greta coal seam was significant in the subsequent development of the South Maitland coalfield. Collieries were established in the 1890s in localities like East Greta, Stanford Merthyr, Pelaw Main, Abermain and Aberdare. Coal mining became the dominant industry in Cessnock in the early twentieth century following the establishment of the South Maitland coalfields. Col. K. G. Mosher, O.B.E., E.D. 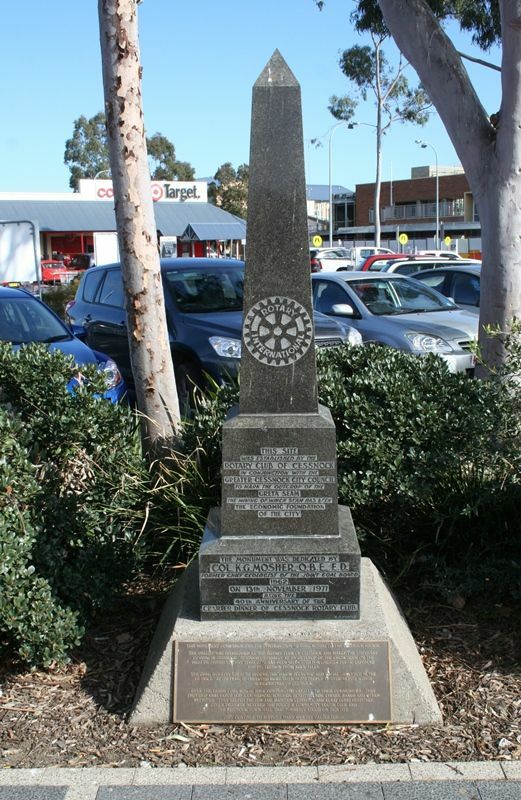 This Monument Commemorates The Contribution Of Coal Mining To The Cessnock Region. 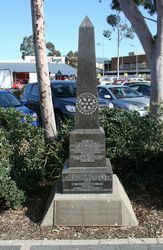 The Obelisk Was Establised By The Rotary Club Of Cessnock And Marks The Discovery Of Coal In Cessnock. It Stood Originally At An Outcrop Of The Greta Seam On The Hillside Behind Vincent Street. It Has Been Relocated For Greater Public Exposure And Protection From Rock Falls. The Coal Industry Grew To Become The Major Economic And Social Influence In The District. At Its peak, It Employed More Than 10,000 People At Over 40 Pits Within 30 kilometres Of Cessnock. Over The Years, Coal Miners Have Contributed Greatly To Their Communities. They Provided Ambulance Services, Medical Schemes, Benefit Funds, Choirs, Bands And Other Amenities. They Helped Pay For And Maintain Cessnock And Kurri Kurri Hospitals. Other Projects Included The Police & Community Youth Club And The Cessnock Town Hall That Formerly Stood On This Site. They Continue To Support Many Worthy Causes Today.